A summer veggie, cooked in the summer way: on a grill! 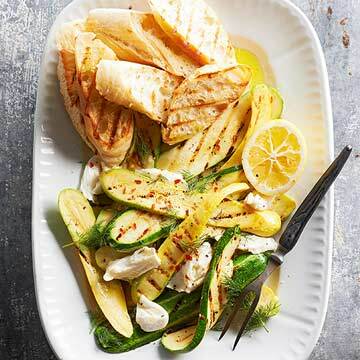 Lemon juice, crushed red pepper and fresh dill add more punch to this warm zucchini salad. On a baking sheet arrange zucchini in a single layer. Drizzle with 1 tablespoon of the olive oil and sprinkle with salt and pepper. On a serving platter arrange warm zucchini and mozzarella. Sprinkle with dill and crushed red pepper. Drizzle with lemon juice and the remaining 2 tablespoons olive oil. Stovetop method: To cook zucchini on the stovetop, prepare zucchini as directed in Step 1. Preheat a grill pan over medium heat. Cook zucchini in hot pan for 6 to 8 minutes or until tender, turning once. Continue as directed.